HomeIn digital retail, there’s Amazon and then there’s … everyone else. In digital retail, there’s Amazon and then there’s … everyone else. When it comes to online retailing in the United States, Amazon’s been cleaning up for years. And now we have new data from comScore that reveals that Amazon is as dominant online today as it’s ever been. * MediaMetrix Multi-Platform, US, December 2017. Source: comScore 2018 State of the U.S. Online Retail Economy. The chart shows that when comparing actual time spent by Americans at each of the Top 10 online retailers, Amazon attracts more viewing time than the other nine entities combined. 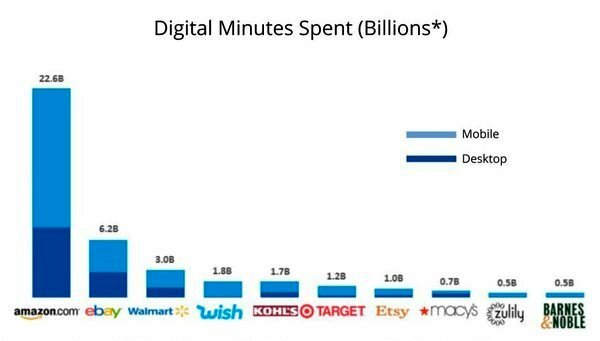 Even when considering only mobile minutes, where so much of the growth is happening for digital retailers, Amazon’s mobile viewing time exceeds the combined total digital traffic across eBay, Walmart, Wish, Kohl’s and Etsy. MediaMetrix Multi-Platform and ecommerce / mCommerce Measurement, Q4 2017. Source: comScore 2018 State of the U.S. Online Retail Economy. 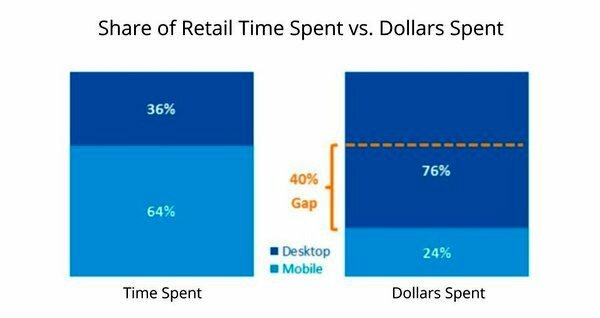 In essence, the data show that whereas mobile represents nearly two-thirds of the time spent with online retail, it accounts for only one-fourth of the dollars spent on goods and services. But this difference is easy to explain: As the largest player in the field, Amazon fulfills a role similar to what Expedia or Trivago do in the travel industry. Amazon gives consumers a way to scan the marketplace not only for product details but also for prevailing prices, giving them a sense of the expected price ranges for products or services — even if they ultimately choose to purchase elsewhere. ← The escalating “arms race” in the adblocking arena. Or here’s another reason: I often search for things on my phone or tablet, spending a lot of the time there while waiting in the doctor’s office or in the airport — or even on the couch in my living room. But I often go to my desktop to complete the transaction. I still find some check-outs don’t function that great in mobile or there’s too much to type in with my thumbs. So it looks like I spend a lot of time shopping on mobile, but I pull the trigger on my desktop where autofill helps me and I keep my credit card numbers in a file that I can cut and paste from easily.